1. Where is your shop situated? 2. What are your hours of business? 3. What type of bikes do you rent? 4. How much does bike rental cost? 5. What is included when I rent a bicycle? 6. What do I need to rent a bicycle? 7. Can I book, reserve bikes on your website? 10. What happens if I get a flat tyre or other problems with my bicycle? 11. Where do people cycle in the Dingle area? 12. What are the roads like? Where is your shop situated? 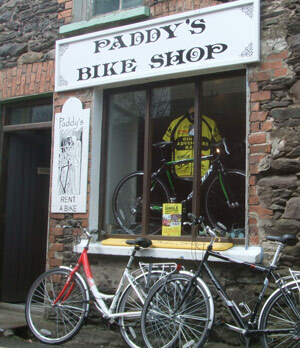 Paddy's bike Shop is situated in Dykegate Lane, in the centre of Dingle town 50 metres from the Main Street, . Click here for Google Map. Paddy's Bike Shop is open from 9 am to 7pm , seven days a week from May to September. In March, April and October the shop closes at 6 pm. The shop is closed completely from November to February. If the weather is particularly bad, on any day, the shop may close a bit earlier. We have hybrid/trekking, mountain and road bikes available. Also a small number of children's bicycles are available for rent. Click here for images of bikes and rates. What is included when I rent a bicycle? With the bicycle you will be provided with a helmet, a lock and a free local route map. Pumps and repair kits are available at no extra charge on request. Can I book, reserve bikes on your website? To book a bike please send an email or telephone + 35366-9152311, for bookings of 10 or more bikes, for rent in July or August, a deposit is required. If you have booked bicycles with me and would like to cancel for any reason, Please let me know by email or telephone (+ 35366-9152311 at least 24 hours before the date you have booked. What happens if I get a flat tyre or other problems with my bicycle? Contact Paddy's Bike Shop using the phone number provided. A replacement bike will be conveyed to you to continue your journey (this normally takes between 30 minutes to 1 hour). Where do people cycle in the Dingle area? If you plan cycling for one day the most popular route is the Slea Head route which winds along the Atlantic Ocean coast road. Enroute you will pass and may visit many archaeological sights, this area is particularly rich in archaeological sites, before coming to Slea Head and the Blasket Island archipelago the mostly westerly islands in Ireland. The roads on the north western side of the peninsula wind along the base of mount Brandon before reaching the small inlet where according to the tale St. Brendan left to sail to America. 1km main roads, 37km other roads. 24km main road, 34km other roads. All roads on the Dingle Peninsula have a tarmacdam surface. The roads can be narrow in places.